He’s a handsome devil, devil being the operative word. He’s the only mean rooster I’ve ever met, but he lives up to the legend. Chloe’s obsession has turned to terror. She literally hides from him. I discovered that you can prevent an attack by pointing at him, so, when he’s in a mood, I cross the driveway or pasture walking sideways, firmly pointing at the manic rooster dancing beside me. He’s fun to look at, though. I’ve never seen a crazy-pouty rooster like that, and he’s very fun to look at. I enjoy your farmily as much as I enjoy your writing about them. Thanks for sharing. It is unfortunate that Chloe feels so threatened by the bird. Maybe she can also learn to “point”? How did you capture his picture without being attack? I knew a woman who drilled a hole in a small wooden block and tied it on her ‘mean’ rooster’s foot [which must have been something to see]! He walked a little funny then, as he had to sling that wooden block out of his way, but it slowed him down enough to aide in the safety of all the rest of the animals and people. Those roosters are horrid. We had one until he nailed my mom behind the knee when she was carrying the “slop pail” to the dump area. Needless to say we had rooster soup with dumplings a day or two later. Can you clip or blunt their talons to soften the damage? Soup might be the better answer. silence ! i keel you. Definitely, poule au pot is the answer, a nice white sauce with mushrooms, rice on the side. Delicious. He may not be tender though, extra cooking time required ! OMG! What great pics! He made me LOL. Looks like a mean dino fer sure. Stay safe! He is beautiful tho. damn gorgeous bird. love that you figured out a way to back him down! He is beautiful and scary at the same time. I too would walk sideways. He is just stunning. 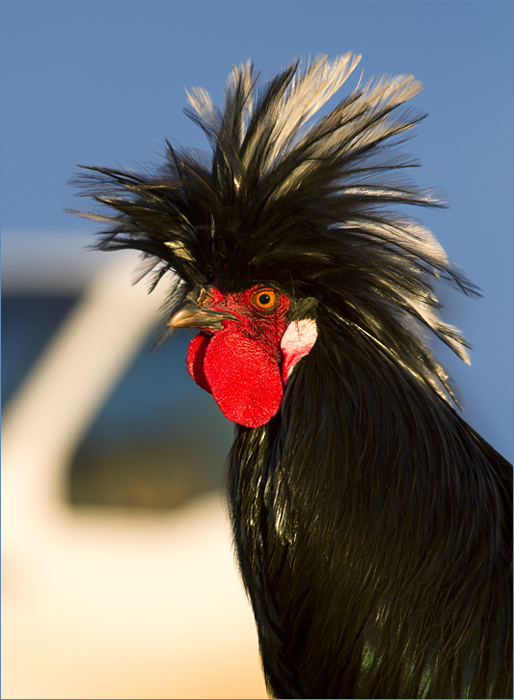 We’ve had a few mean roosters throughout the years. My two dobermans were terrified of Mort. He would come running from the woods and they would high tail it outta dodge. Once he started leaping onto my back, he sealed his fate. I’ve never seen more beautiful colors than those produced by roosters though. Hahahaha! Made my day! Glad you found a way to get him to “stand down”! Poor Chloe!!! To live in fear!! I hope Charlie isn’t hiding Also! He is especially handsome in his picture today! Scary to live with poufy man! Be careful! Ps. Also glad you are feeling great again!! HAHAHAHAHAHA!!!!! I needed a good laugh this morning! I think I’d run and hide too, he looks pretty scary! So now you have a guard rooster! Back off…I always try and figure behaviors..what triggers them especially in animals!? Anyone know here why?? This rooster is so crazy looking that hair hehe! 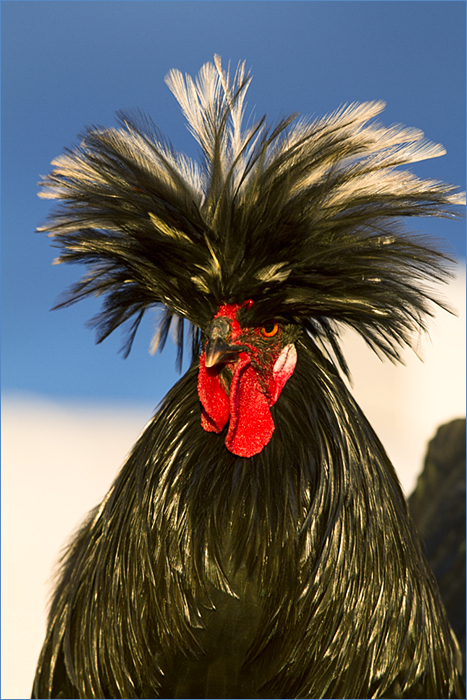 My aunt Madlyn had crazy roosters–even the ordinary white guys. She figured it was because she stole “his” eggs every morning. But she always put the fertilized ones back!. 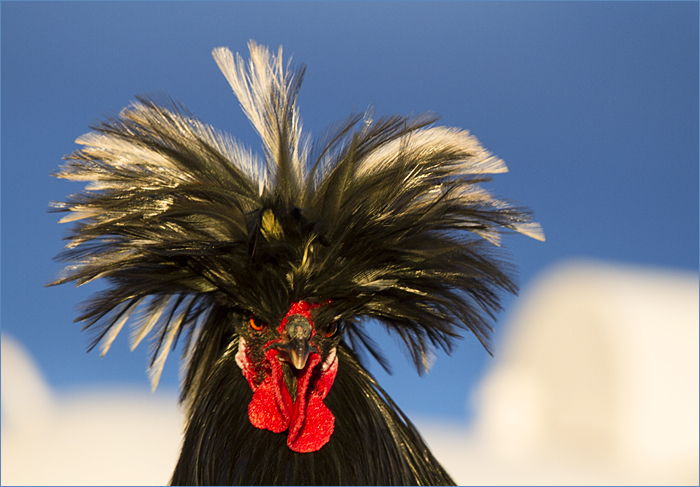 This rooster was simply born for stand-up… right? I mean, look at ‘im. Add that personality, & voila! Comic extraordinaire. How is it even possible for any living, breathing creature to be so hilarious-looking & so beautiful, all at once? Poor Chloe – would it make it any better at all to put a bell on this little Nazi? Probably not, & oh dear, now he’s going to strut his way down here to peck my eyes out for suggesting it. we had a big white leghorn who used to hide up in a tree that over-hung the barn road. he would fly down onto the back of anyone who walked under the tree, and peck wildly at their head! until the day he had a close encounter with a pitchfork. Wow. We watch a lot of soccer now and it has improved my Pointing Ability immeasurably- I imitate the referees I like and it seems to work on almost everyone. Except of course, The Partner and The Dog. Awesome feathers! LOVE the chicken – chloe dance! Sounds like you’re using what I call The Pointing Finger of DOOOOOOOOM. I use it with my dogs and other dogs I encounter whe I’m out and about. It’s surprisingly effective in lots of situations. Of course, you have to have the attitude to back that up. Those red eyes freak me out. It’s funny how giving the finger to an animal is the best threat. I don’t know why, but when I give the finger to my cats, they immediately behave better. We need to try this on other species. What a crack up, Shreve!! Hysterical! He is sooooo cool looking. Magnificent bird! I bet he would win a prize in a show! Looks like he knows it, too! Aw, poor Chloe. Maybe you should make her some Rooster Fricassee…. FYI: WoW! Where have I been. We lost our beagle Gracie back in March and in May, I rescued another beagle girl named…. CHLOE. I’m just now shaking my head that we both have Chloe’s…. Give her a hug from me…. Yes! And the Christmas tree necks when they go after feet and each other!!! i can just picture your rooster getting the stare-down with the death point! Unfortunately pointing did not give me any respect from one little mad man Bantam rooster we had. So one day out of desperation (since he progressed from going after my feet to my face) i just put an empty grain bucket over him as he was launching off to get me! I was able to then feed the other gentle ones of the flock in peace. i released him as i dashed for the gate. He’d quickly try to shake the darkness from his eyes and at the same time do a little fast forward scramble to find me! Of course my daily scream gave away my location and i barely made it out! but at least i got to visit with all the sweet chickens he was so good at guarding! ahhh, such memories of my ex-husband. amazing eye candy, unfortunately psycho. Oh man, bp & taffy – hiLARious! Thx for the laughs. ditto to Jenny, LOLOL x infinity over here!!! Have you tried running at him and screaming, while waving your arms? Friend of mine had a mean rooster and claimed that after doing that a few times, he left her alone. He still went after everything else that moved, and would occasionally walk up and test the waters, but a quick yell and short charge at him made him think better of the idea. Theres no guarantee it will work with your particular featherhead, but it might be worth a try. Less potentially lethal than my mom’s technique with the 2X4, thats for sure. Well, I nevah. I’ve never seen a bird like that!!! Those feathers… incredible. My friend who lived on a ranch in high school had a mean turkey, Tom, who would chase us. No one knew how old he was— he was just always there. Poor Chloe. Sounds like she got pecked. I have to wonder if Charlie would put Evil Mr. Devil Pouf in his place. Do you have other roosters and is *this* rooster the dominate? Does he pick on the other roosters or do they defer to him? I always thought there could be only one rooster because they’d fight. Then again, your bulls have proven common thought is often inaccurate. I agree that if it gets down to a problem that has to be solved, there are plenty of recipes for Coq a Vin. I’d go with Julia Child. The tail feathers are wonderful on hats and fascinators. Ruby: I despise a floggin’ rooster. Ruby: Let’s put him in a pot. Our running joke has been that the top dog at our house is a chicken! The dogs have those grownup chicks some respect after a hearty peck or two. I’ve noticed though that the fowl wisely give a dog with a bone a wide berth. Also they seem to respect the hawks that come into our yard. Merry Christmas to all the farmily! I remember playing at a friends farm circa 1965. We were on the ridge and I started running down the hill and as I entered the clearing their rooster came running toward me like a bat out of hell as they say pecking at my legs. I ran to the house yelling as everyone laughed but if that rooster had looked like Sir Psycho I’d still be having nightmares!! So I feel one with Chloe. Sad for the others that you are keeping a mean rooster. No matter the appearance. A bad rooster is not good for the hens. It’s not funny or cute really and bad tempered roos do exist. They should also not be allowed to breed and those eggs to be hatched. Bad temper is hereditary. Do your sweet hens a favor and find him another home or eat him. SW ~ he’s quite chill around the hens – perhaps his behavior towards non-birds is actually protective of them? Rest assured, our hens are not being stressed by him, nor attacked. I have a huge Buff Orpington roo. When he was a very young roo he decided to come after me, and got booted across the coop for his trouble. Ever since then, he’ll squawk and dance, but keeps his didtance. Good thing, because rooster & dumplings can be on the menu right quick. I’m rather saddened by the comments calling for “rooster soup”. He’s valiantly protecting the flock and willing to put himself in harms way against creatures many times his size and strength to do so. That is a roosters purpose – to protect the flock at all costs. “Mean” roosters do not exist. Protective ones do. I had a mean rooster once, and he took over my 2 little brown hens, my mom and had to leave the back door with a broom to protect our selves. Ha. Nothing tastes better than angry rooster, my Gramps used to say.